Early in the morning of August 24, 1939, the foreign minis­ters of Nazi Germany and the Soviet Union signed a treaty of non­aggres­sion, formally known by the two signa­tories’ names—the Molotov-Ribben­trop Pact, which bore the date August 23, 1939. Neither foreign minis­ter Vyache­slav Molotov (who was also Soviet Premier) nor Joachim von Ribben­trop had any­thing to do with crafting the pact between the long-standing state enemies. Indeed, Soviet Com­mu­nist Party Chair­man Joseph Stalin was the prime mover in for­mu­lating the policy of non­inter­ven­tion in each other’s affairs (reputedly in 48 hours) that led to the noto­rious pact. A secret codicil to the bilat­eral pact divided the nation states in Cen­tral and Eastern Europe between the treaty part­ners to follow Germany’s Septem­ber 1, 1939, invas­ion of Poland, its neigh­bor to the east and the Soviet Union’s to the west (see map below). On June 30, 1941, a week after Hitler’s Wehr­macht had invaded their coun­try, repre­sen­ta­tives of the top three tiers of Soviet govern­ment met to create the State Defense Com­mi­ttee, known by its Russian ini­tials as GKO. The State Defense Com­mit­tee would take direct respon­si­bility for pros­e­cuting the war against Nazi Germany. 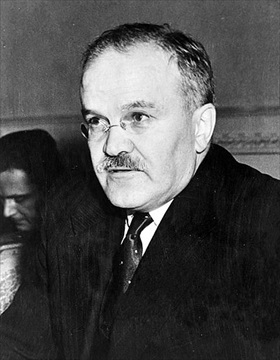 On this day, July 1, 1941, Molotov’s cabi­net appointed Com­mu­nist Party Chair­man Stalin to head the GKO owing to his recog­nized author­ity and years of ser­vice to the cause of Soviet Bol­she­vism. Molotov was appointed deputy chair­man. It would take almost four years and cost the Soviets 40 mil­lion com­bat­ant and civilian deaths (±10 mil­lion; the scope for error is very broad), plus mil­lions more wounded, maimed, or simply lost in the Great Patriotic War before Stalin’s rousing July 3, 1941, call to “rise in defense of our native land” turned an apparent sure-fire Soviet defeat into an Allied victory over Nazi Germany. 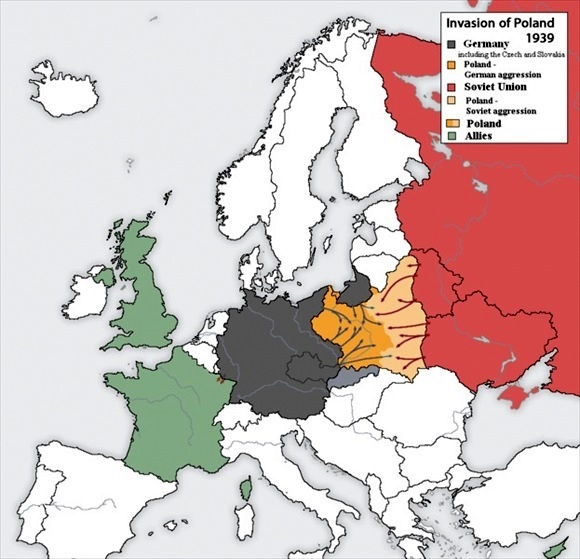 Above: Invasion and conquest of Poland by Germany and the Soviet Union in Septem­ber and early October 1939. The coral-colored area overlaid with arrows repre­sents Polish terri­tory in the west that fell within the German zone of occu­pa­tion, the pinkish area repre­sents Polish terri­tory in the east that fell to the Soviets in accor­dance with the secret codicil appended to the Molotov-Ribben­trop Nonag­gres­sion Pact of August 23, 1939. The German inva­sion of Poland on Septem­ber 1, 1939 (not the Soviet inva­sion of Poland on Septem­ber 17), triggered World War II in Europe after Great Britain and France announced their inten­tions to ful­fill their military-assis­tance obli­ga­tions to Poland under terms of sep­a­rate bilat­eral treaties, one of which was signed in London in the last week in August. (The French would ratify their treaty a day after Britain and France declared war on Germany on Septem­ber 3.) The Anglo-French-Polish treaties had no effect on what Poles called their 1939 Defen­sive War. By Octo­ber 6, 1939, the col­luding efforts of German and Soviet armed forces had effectively liquidated the Polish state. Left: Joseph Vissarionovich Stalin (1878–1953) was the ruth­less leader of the Soviet Union from the mid-1920s until his death. 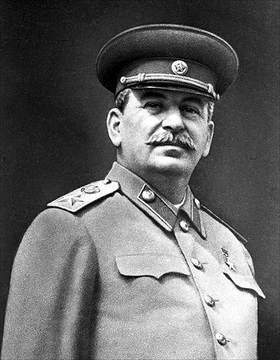 He was born Josif Vassa­riono­vich Dzhuga­shvili and adopted the name “Stalin”—in English, “man of steel.” He was short (between five feet four and six), broad chested, weighed about 190 pounds (86 kg), had a withered arm due to a child­hood acci­dent, and walked with a roll owing to a club­foot. His mustached face, pock­marked by small­pox (air­brushed out in this heroic-looking por­trait), was framed by large ears and offset by piercing hazel eyes. With­out his cap his hair appeared slicked back. When he spoke his voice was harsh, revealing teeth darkened from heavy smoking. Holding the crucial posi­tions of General Secre­tary of the Cen­tral Com­mit­tee of the Com­mu­nist Party of the Soviet Union and from May 1941 onward Chair­man of the Council of People’s Com­mis­sars (the equi­va­lent of a Western head of govern­ment), Stalin was effec­tively the dictator of the state, answer­able to no one after having killed off or banished every conceiv­a­ble oppo­nent. The large star seen on Stalin’s shoulder board iden­ti­fies him as a Marshal of the Soviet Union, a rank the dictator gave himself in March 1943. Right: Vyacheslav Mikhailovich Molotov (1890–1986) was a protégé of Stalin. Born Vyache­slav Skryabin, Molotov, like Stalin, adopted a new last name, which trans­lates to “man who smites with hammer.” A plodding, dour, inscru­table bureau­crat who success­fully nego­ti­ated the slippery, often deadly steps of Soviet cut-throat politics, Molotov served as Chair­man of the Coun­cil of People’s Com­mis­sars from 1930 to 1941, and as Minis­ter of Foreign Affairs from 1939 to 1949 and from 1953 to 1956. After Molotov fell out of Stalin’s favor, he was spared an early death when the 74‑year-old Soviet dic­ta­tor died five days after suffering a cerebral hemorrhage on March 1, 1953.